What's the best way to prevent slips and falls? Based on the number of injuries in the workplace due to slippery floor conditions, there is no simple answer. A slip and fall occurs whenever there is too little friction or traction between your feet and the surface you are walking on. While the major cause of slip and falls is surface contamination that reduces the contact between the feet and the floor surface, there are several other factors that also contribute to slip falls like the environment, footwear, floor material, use of surface, behaviour. Some of the contaminants can be water, oil, dust and anything that reduces the traction and make the floor surface slippery. No single solution, any one solution -- be it slip-resistant shoes, micro etching, mats, proper cleaning practices or worker awareness -- will not eliminate the hazard. OH&S professionals who want to implement, upgrade or review their slip-prevention programs need to ensure that they consider all aspects of what causes a slip and what can be done to reduce or eliminate one of the workplace's most common hazards. Malcolm C. Robbins, a forensic engineer in San Diego who studies slip-and-fall accidents, said that unless someone can design a 100 percent slip-resistant environment and plan for the worst condition possible, the hazard cannot be eliminated. "If you say something is 90 percent effective, that still leaves 10 percent for an accident." 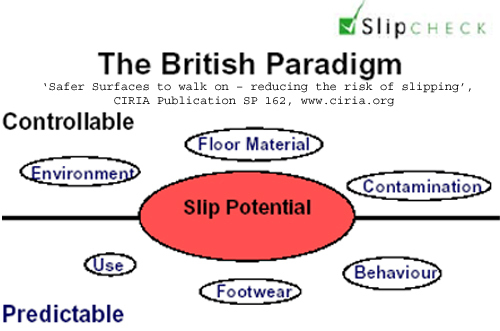 So, what can I do as an employer or controller of premises (or my home) to prevent slip falls? While there is various legislative requirements for an Employer or Controller of Premises, identifying of foreseeable hazards and elimination or control of risks applies to everyone. Defn; a person who has only limited control of the premises, and a person who has under any contract or lease an obligation to maintain or repair the premises. If risks cannot be eliminated consultation is required with relevant stakeholders. We can predict the Use of the surface, type of Footwear will be used on the surface and Behaviour of people and equipments using the floor surface and can develop Environmental, Floor Surface Material and Contamination controls as well as guide on suitable Footwear and educate Behaviour. Footwear: While any slip-prevention program should include several elements, slip-resistant footwear is a key to making the program work. To make sure that a shoe is truly slip-resistant, ask the manufacturer for test results that should come from an independent lab to ensure that results are valid. The two factors to achieving slip resistance with a shoe: the rubber compound and the tread pattern design, including the tread's surface-to-void ratio. The rubber compound needs to be soft enough to provide slip resistance but hard enough to last and maintain its tread pattern after contact with floor surfaces and contaminants. The tread pattern design should have a grid pattern that channels water, grease and other residues away from the bottom of the shoe. Ensuring that items being carried or pushed do not prevent them from seeing spills. Include employees in all phases of a slip-prevention program. "They're going to know best about the work areas, hazards and solutions." For further information regarding to the development of the Floor Safety / Slip Resistance Register click on Carl Strautins or to get your nearest Authorised Dealer�s contact details or click on Enquiry and provide us with your details and specific concern and your nearest Safety representative will contact you.